Are you up for a challenge? 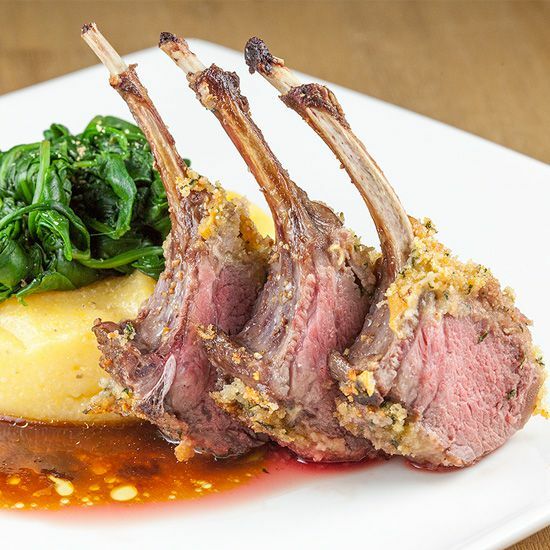 Cook up this herb crusted rack of lamb and be amazed by it's flavors. Recipe for two, ready in an hour. Hold onto your hats.. this small dish generates a lot of dishes! CHECK the rack of lamb and see if there’s any excess fat left on the meat. Only remove lumps of fat. Let’s start by preparing the herb crust. FILL one of the small pans halfway with water, bring that to a boil. FILL one of the bowls with ice water, place it near the cooker. PLUCK all of the leaves from the sprigs of mint. Use a skimmer to quickly boil the mint leaves 5-10 seconds. Immediately transfer the mint leaves to the bowl containing the ice water, this stops the cooking process. By boiling and chilling the mint leaves, they keep their green color when handled. Otherwise they will most likely turn brown and/or look bland. DRAIN the ice water from the bowl and squeeze out any remaining water from the mint leaves. Just gather all of the leaves into the palm of your hand and squeeze firmly. PLACE the mint leaves in your (small) food processor. CRUSH two cloves of garlic and add into the food processor. ADD in 1 teaspoon of cayenne pepper along with a nice big pinch of salt, freshly ground black pepper and 1/2 cup of breadcrumbs. ADD in just enough olive oil to make the mixture moist and pulse the mixture until well blended. REMOVE the mixture from the food processor and transfer to a small bowl. MIX in grated cheese to liking using a spoon. It’s possible to add in the grated cheese before mixing, that just makes the mixture more fatty. Now we need something that makes the breadcrumb mixture stick to the rack of lamb. Which is a simple mustard mixture. CHOP up about 10 small leaves of rosemary using your chef’s knife and cutting board. MIX that with two tablespoons of Dijon mustard and we are good to go. 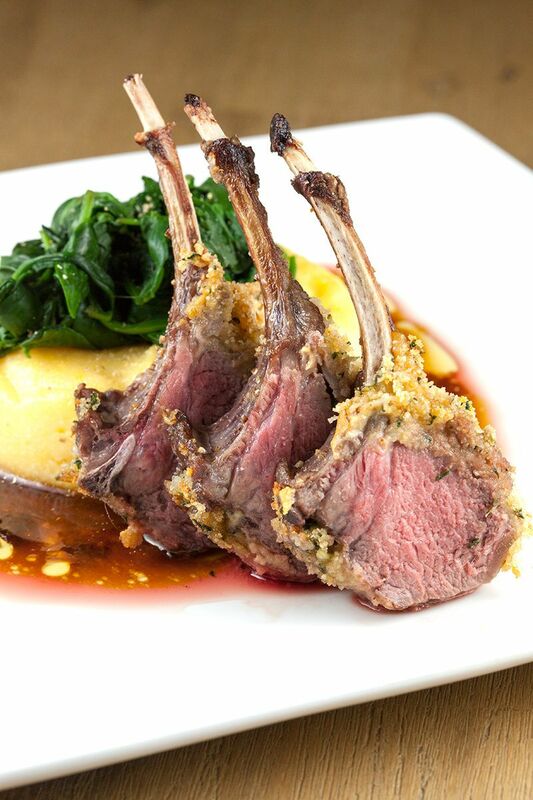 HEAT up olive oil into the skillet and sear the rack of lamb shut, don’t throw away the blood and olive oil. We found it handy to use a meat tong for this. We will need this later on. You can skip this step if you really want to, but we think this makes the meat a little bit more tasty. PRE-HEAT your oven to 400 degrees fahrenheit or 200 degrees celsius. LINE the baking tray with aluminium foil or tin foil. PLACE the rack of lamb onto the pre-lined baking tray and coat the thick, meaty side with the mustard mixture using the backside of a small spoon, or use your fingers. 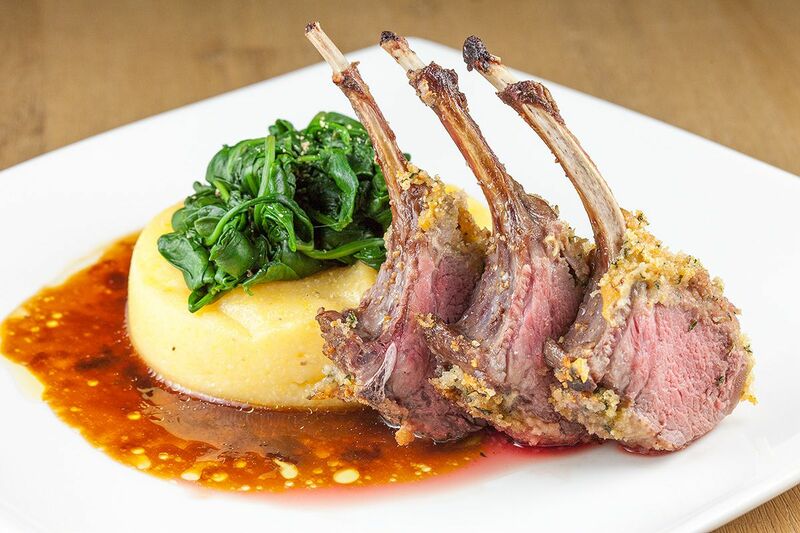 ENCRUST the rack of lamb using the mint and breadcrumbs mixture. PLACE the rack of lamb onto the spilt breadcrumbs and remove any excess breadcrumbs using a kitchen towel. PLACE the herb encrusted rack of lamb into the pre-heated oven for 20 minutes for rosé, or longer if you really want to. MEANWHILE, prepare the polenta and spinach. ADD 2 cups of water to a small pan and bring to a boil. ADD in 1 cup of polenta and keep stirring to prevent it from burning. The polenta should be ready after 10-15 minutes, depending on the type of polenta you use. SEASON with grated cheese, some salt and pepper. SHAPE the polenta any way you like. We should still have the skillet with lamb blood and olive oil, add in 150 ml of game fond and bring to a boil. REDUCE to a thick sauce. LASTLY, heat up a small amount of water in the small saucepan and add in a handful of fresh spinach leaves. When the spinach leaves have shrunk, add in another handful of spinach leaves. REPEAT until you think you have enough spinach ‘pulp’ for two people. By now the rack of lamb should be done, remove from the oven and let rest for 10 minutes before serving. SERVE 3-4 pieces of lamb per plate, place the polenta on the bottom. 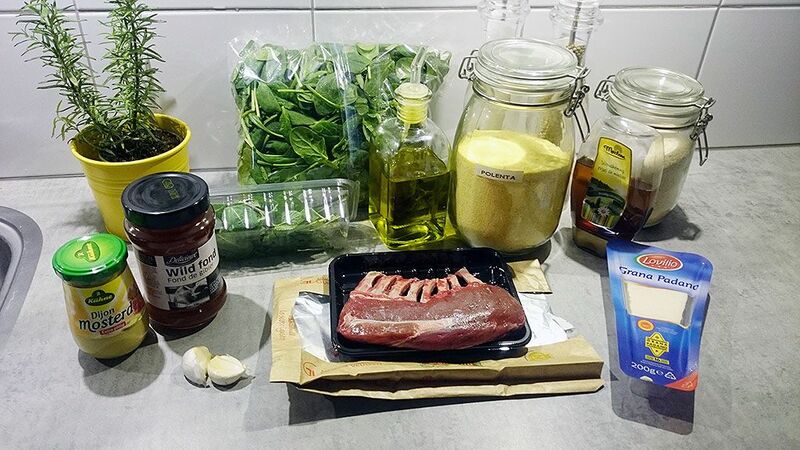 ADD spinach on top of the polenta, place the rack of lamb chops against the polenta and finish by pouring 1/2 of the wild game sauce next to it. Enjoy!